Wills and obituaries can be a great source of genealogical information. If you have wills or obituaries from former residents of Stephentown, and are willing to share them, please let me know and I will put them here. In the name of God Amen. I, Joseph Rogers of Stephentown in the County of Rensselaer and State of New York, being through the goodness of God in Health of body and a disposition or disposing mind, and many thanks be to God, therefore Do Make and Ordain This My Last Will & Testament, that is to say first of all, I give and remand my Soul to God that gave it and my body commend to the earth after my Death, to be buried in a Christian-like decent burial at the discretion of my beloved son, Joseph, nothing doubting that at the General Resurrection, I will be raised again. And so it hath pleased God to bless me with some things of worldly substance, I give & dispose of it in the following manner. 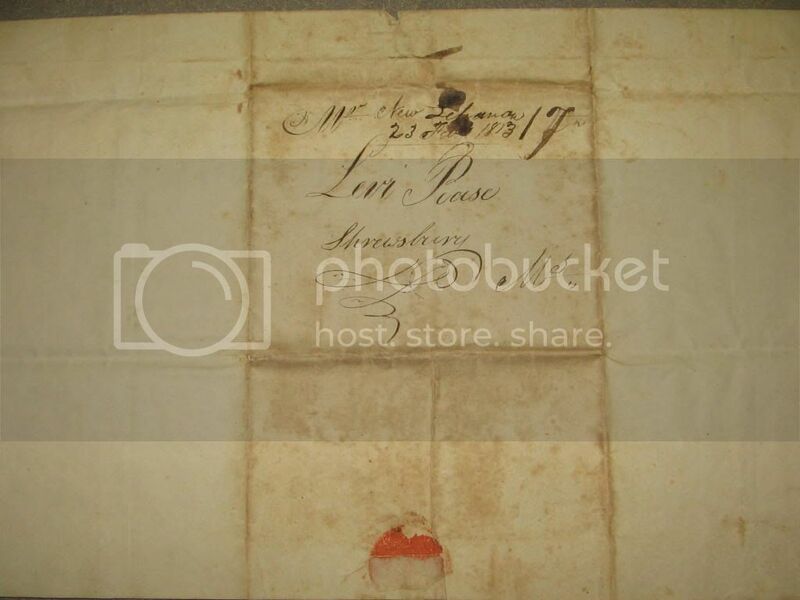 I give and bequeath to my beloved wife, Anna Rogers, all the particular articles set forth in a particular writing or obligation signed to my beloved son Joseph by said beloved wife (viz) the east room of my now dwelling house to have the same for her own use. Also, a privilege in the kitchen and buttery chamber, garret or cellar what she may need for her own use. Also, a privilege in the orchard for apples to use in the house, and my Executor shall male Five Barrels of Cyder Yearly when the orchard shall bear fruit sufficient and deliver the same to my beloved wife, as long as she shall remain my widow for her own use; also two good Cows, one of them to be kept on the farm both winter and summer during her natural life without charge to her; the other at her own disposal. Also, a privilege to get her five wood pone hog to run in the pasture without charge to her and also a garden spot by the house to raise __(?) and one acre of planting land where it will best suit the owner for her to plow & plant. Also, in addition to the above prescribed articles, I give to my beloved wife, Anna Rogers, five good sheep, one good Hog to kill, three geese and six dung bill fowl to be her own property with the increase but not to keep more than three geese and five fowls over or through any winter nor more than five sheep, and also, one third part of the household goods and furniture that shall or have been added by her inventory together with all the household furniture that she did or hath brought to me and to be sure to have one bed and furniture if there should not be two more remaining, and also, one set of curtains which are of her own make, all which shall be at her own disposal. The above mentioned two cows, five sheep and hog to be taken out of the block before any division, at her own choice; also I give her the use of my best side saddle while she shall remain my widow and after that I give and bequeath the said saddle to my beloved Grand Daughter Electa Stillwell and if she should not survive or outlive my beloved wife, then the said side saddle to be given to Sarah Rogers Stilwell. 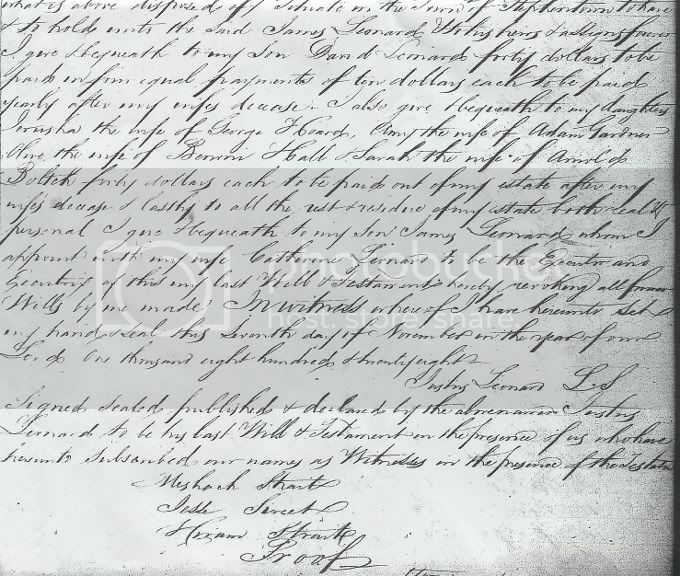 (I would have it understood the above mentioned writing, signed to my beloved son Joseph sets forth that my beloved wife was to have one quarter, but it is my intention that she shall have one third of the mentioned articles.) Item. 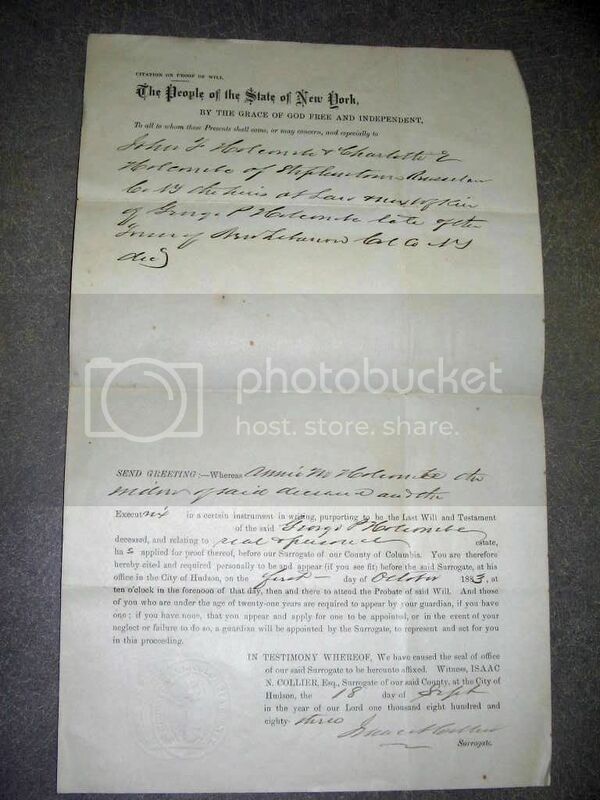 Also, I give and bequeath to my beloved son Joseph Rogers whom I now appoint my lawful Executor to this my last Will & Testament, all my home lot lying and being in Stephentown, not heretofore given away by Deed, with all the privileges of sustenance thereunto belonging (except above exceptions) and also I give unto my said son Joseph, my best Bible and all my wearing apparel, (except my best hat), with my best saddle & bridle, with all my farming utensils. Item. I give & bequeath to my beloved daughters Thankful Benn, Joanna Brown, Mehetable Sweet and the children of my daughter Sarah Stilwell deceased, Margaret Greenfield and Martha Brown, all my household goods and furniture except what is before given away, to be equally divided into five parts, and one fifth part to be equally divided amongst the children of Sarah Stilwell. And also my will is that if need be to pay my debts that the lot of land in Stephentown called by the name of Dye Lott should be sold for that purpose and if not needed to pay my debts, then to be equally divided amongst all my children with the other Lott that I last purchased, that is to say Ministerial Lott, my son Joseph to have an equal part with his five sisters and the heirs of Sarah Stillwell as above named. And also my will is that funeral charges and just debts to be paid out of the money that is due or may become by notice otherwise and personal estate such as Chattels or moveable flock, and if anything should remain after my just debts and funeral charges shall be paid, my will is that it should be equally divided amongst my five daughters and the heirs of my daughter Sarah deceased, her children to have one equal share with one of my other daughters, this being all before mentioned. Item. I give and bequeath my best Hat to my beloved Grandson James Rogers, also I give and bequeath to the heirs of my daughter Sarah Stilwell, deceased, as above mentioned, to each of them as they shall become of age after my decease, six pounds, thirteen shillings and four pence, which my said executor is directed to pay to them with the lawful interest after my decease out of money or stock that shall be left with him. And I do hereby utterly disallow, revoke and cancel all and any other former testament, wills, legacies, bequests and executor by me or any before named will and bequeathed Authifying and confirming this and no other to be my Last Will and Testament. IN WITNESS whereof I have hereunto set my hand and seal this sixteenth day of March in the year of our Lord and Savior one thousand seven hundred ninety eight. And in the twenty second year of American Independence. Rensselaer County. Be it remembered that on the Seventeenth day of December in the Year of Our Lord One Thousand Eight Hundred, personally appeared before me John Woodworth, Esquire, Surrogate of the said county, Jonathan Niles, who being sworn on his oath declared that he did see Joseph Rogers, late of the County of Rensselaer, deceased, sign and seal the annexed written instrument and heard him deliver it for the use therein mentioned. That, at the time thereof, he, the said Joseph Rogers, was of sound disposing mind and manner to the best of the knowledge and belief of him, the deponent, that his name subscribed thereto is of his own proper hand and name and that he together with John Cook and Archeclaus Lynes did subscribe their names hereto as witnesses in the presence of the Testator. And in the same day Joseph Rogers, Executor in the said Will named, personally appeared before me and was duly sworn to the faithful performance of said execution thereof by taking the usual oath as Executor. Dated this Eighteenth day of December, One Thousand Eight Hundred and the twenty fifth year of our Independence. I purchased this will from Sampubco and transcribed it myself. He really lived in Berlin but he is buried and lived for some time in Stephentown. His wife was Sarah Grace Sweet, daughter of Amos Sweet and Elizabeth Straight of Rhode Island. 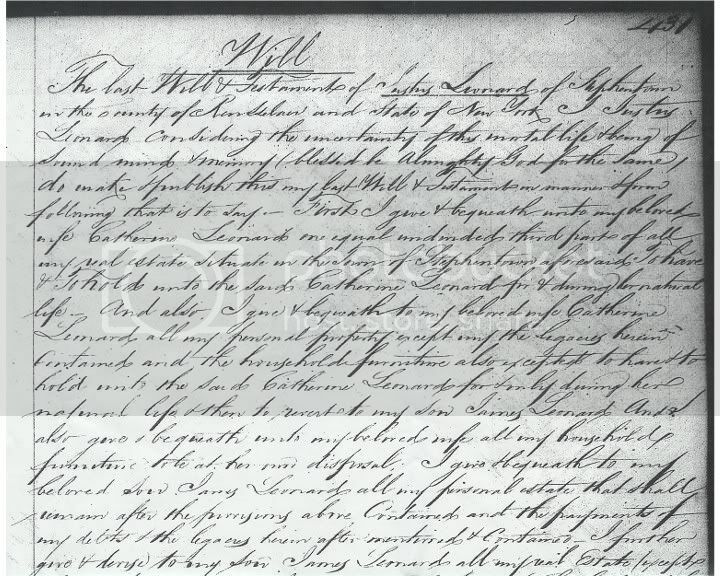 The Last Will and Testament of Augustus Jerome deceased with the probate thereof Recorded September 15, 1817. For the name of God Amen. I, Augustus Jerome of the town of Berlin, in the County of Rensselaer and State of New York being weak in body but of sound & perfect mind and memory, blessed be the Almighty God for the same, do make and publish this my Last Will and Testament in manner and form following, (that is to say) after paying all my just and lawful debts, I give & bequeath to my son, **Viscount Alonson Jerome, the sum of five dollars. I also give and bequeath to my daughters, Waty Jones (wife to James Jones) Elizabeth Jones (wife to Daniel Jones) Hannah Hull, (wife to Justus P. Hull) Caty Jerome, (single woman), and to my son Hilton R. Jerome and also to my daughter Polly Jerome, (single woman) and to my grand daughter, Hannah Foster (single woman) all my goods, chattels, lands and tenements both real and personal, situate lying and being in the Town of Berlin, County of Rensselaer, State of New York equally to be divided between them, to hold to them the said Waty Jones (wife to James Jones), Elizabeth Jones, (wife to Daniel Jones), Hannah Hull (wife to Justus P. Hull), Caty Jerome, Hilton R. Jerome, Polly Jerome and Hannah Foster, their heirs and assigns forever And I do hereby appoint Samuel Vary, Esq. of the Town of Berlin and Daniel Jones, aforesaid of the Town of Hoosac Executors of this my Last Will and Testament, hereby revoking all former wills by me made. In Witness whereof I hereto set by hand and seal the 7th Day of July, in the year of our Lord 1817. Signed Sealed, Published and declared by the above named Augustus Jerome to be his Last Will and Testament in the presents of us who have hereunto subscribed our names as Witnesses in the presents of the Testator. The people of the State of New York by the grace of God free & independent. To all whom it may concern (lend gravity?). Know ye that at the City of Troy in the County of Rensselaer on the fifteenth day of September in the year of our Lord one thousand eight hundred twenty five before Thomas Clowes Esquire Surrogate of our said county the Last Will & testament of Hosea Moffit late of the town of Stephentown in the County of Rensselaer & State of New York deceased (a copy whereof is hereunto annexed) was proved and is now approved & allowed by us & the said deceased having whilst he lived & at the time of his death goods, chattels or credits within this state (by means whereof the proving & registering the said Will & the granting administration of all singular the said goods, chattels & credits & also the auditing allowing & final discharging the amount thereof doth belong to us ) the administration of all singular the goods, chattels & credits of the said deceased & any way concerning said Will is granted unto Elajah Graves, Jay Moffit & Ralph Moffit Executor in the said Will named the being first duly sworn (well) & faithfully to administer the same & to make & exhibit a true & perfect inventory of all & singular the said goods, chattels, & credits & also to render a just & true accounting thereof when thereunto required. In testimony whereof we have caused the seal of office of our said surrogate to be hereunto affixed. Witness Thomas Clowes Esquire Surrogate of the said county at the City of troy the fifteenth day of September in the year of our Lord one thousand eight hundred twenty five. State of New York Renesselaer (Be it remembered that on the fifteenth day of September in the year of our Lord One thousand eight hundred & twenty-five personally affirmed before me Thomas Clowes Esquire Surrogate of the said County of Renesselaer Amos Pardee, Caleb Chapman & Calvin P Sackette the subscribing witnesses of the Will of Hosea Moffit late of the town of Stephentown in said county deceased who being duly sworn declared that they did see the said Hosea seal & execute the annexed written instrument purporting to be the last last will and testament of the said Hosea bearing the date this thirty first day of August in the year of our Lord one thousand eight hundred & twenty- five & heard him publish & declare the executors & for his last will & testament that at the time thereof he the said Hosea was of sound disposing mind & reasoning to the best of the knowledge & belief of the said Amos Caleb & Calvin & that they the said Amos, Caleb & Calvin severally subscribed their hand & names to the said will as witnesses thereto in the presence of the testator & each other. 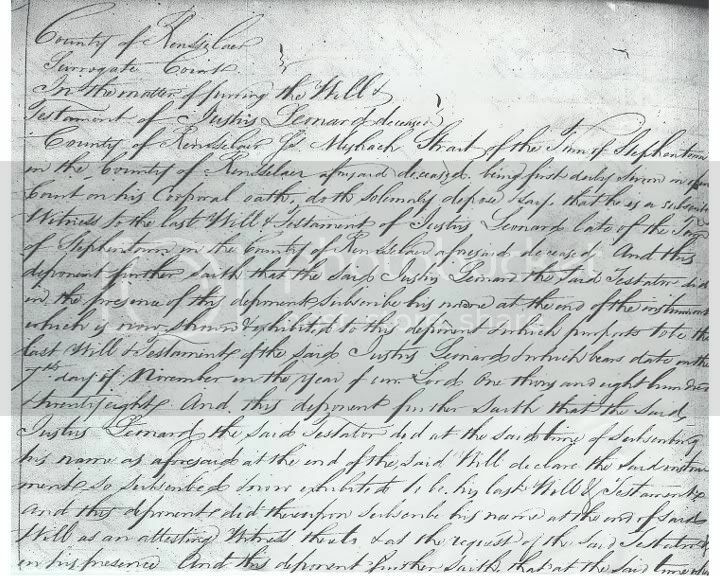 A copy of the last will and testament of Stephen Arnold, deceased, with proof thereof Recorded April 4, 1810. In the name of God amen, I Stephen Arnold often of Stephentown in the County of Rensselaer and in the State of New York, being weak in body but of sound and perfect mind and memory do make and publish this my last will and testament in manner and form following (that is to say) first I bequeath unto my beloved wife Martha Arnold, the right and use of all my personal estate after my funeral charges and just debts are paid during her natural life or during her remaining my widow at her decease or after her widowshood shall or may close I give and bequeath all my said personal estate in the following manner to be divided into four equal parts, one part I bequeath to my daughter Honor Carpenter the wife of Samuel Carpenter, one part I give and bequeath to my daughter Martha Douglas, the wife of Benajah Douglas, one part I give and bequeath to my daughter Mary Gardner, the wife of Robert Gardner, and the other part I give and bequeath to my granddaughter Martha Arnold the daughter of Beriah Arnold, Deceased. Further I give and devise to my beloved wife Martha Arnold the right use and improvement of all my real estate during her natural life or during her remaining my widow and at her decease or after her widowhood shall or ? cease I give and devise all my said real estate to be divided into four equal parts, one part I give and devise to my said daughter, Honor Carpenter, wife of said Samuel Carpenter, one part I give and devise to my said daughter Martha Douglas, wife of said Benajah Douglas, one part I give and devise to my said daughter Mary Gardner, wife of said Robert Gardner and one part I give and devise to granddaughter Martha Arnold, daughter of Beriah Arnold, decased. To hold to them the same Honor Carpenter, Martha Douglas, Mary Gardner and Martha Arnold their heirs and assigns forever. Lastly I do hereby nominate constitute and appoint my said beloved granddaughter, Martha Arnold as executrix and my Grandson Arnold (?) Executor of this my last will and testament hereby revoking all former wills by me made in witness whereof I have hereunto set my hand and seal the eight day of February in the year of our Lord one thousand eight hundred and ten. The People of the State of New York by the grace of God Free and Independent L.L. To all whom these presents shall come or may concern ? Greeting, Know Ye. That at the City of Troy in the County of Rensselaer, on the fifth day of June in the year of our Lord one thousand eight hundred and twenty nine before Philip Viele, Esquire. 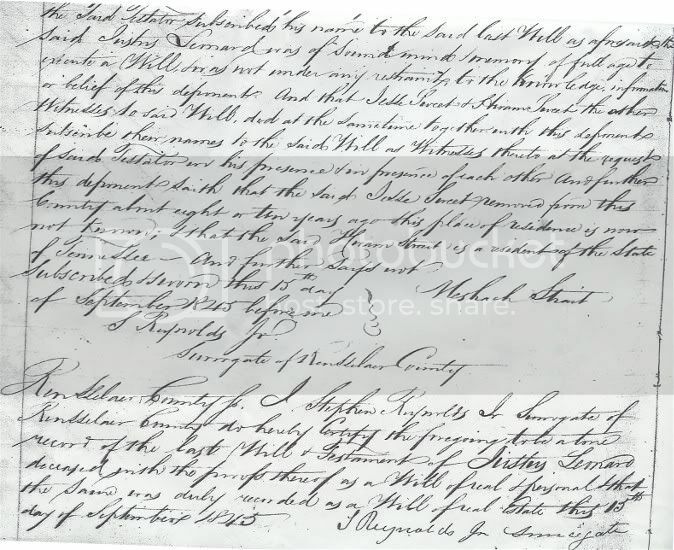 Surrogate of our said county, the last Will and Testament of George Arnolds late of the town of Stephentown in the County of Rensselaer and State of New York deceased, ( a copy where of is hereunto annexed, was proved and is now approved and sealed by us; and the said deceased having whilst he lived and at time of his death, goods chattels and Credits and also the auditing allowing and final discharging the account thereof doth belong to us, the administration of all and singular the Goods, Chattels and Credits of the said deceased and any way concerning his will is granted unto Simon Arnold and Elijah Arnold the Executors in the said Will named there. Being first duly sworn will and faithfully to administer the same and to make and exhibit a true and perfect inventory of all and singular the said Goods, Chattels and Credits and also to render a first and true account thereof when thereunto required. In testimony whereof we have caused the seal of Office of our said Surrogate to Be hereunto affixed. Witness Philip Viele, Esquire, Surrogate of the said county at the said City of Troy, the fifth day of June in the year of our Lord one thousand eight hundred and twenty nine. being of sound mind memory, blessed be Almighty God for the same. Do make and publish this my last will and testament in manner and form following. That is to say First. Stephentown, twelfth day of May in the year of our Lord one thousand eight hundred and twenty six. witnesses in the presence of Testator. Eldred Bentley, John Moon, Elijah Graves. This isn't a will or obit, but I thought that it was interesting nonetheless. 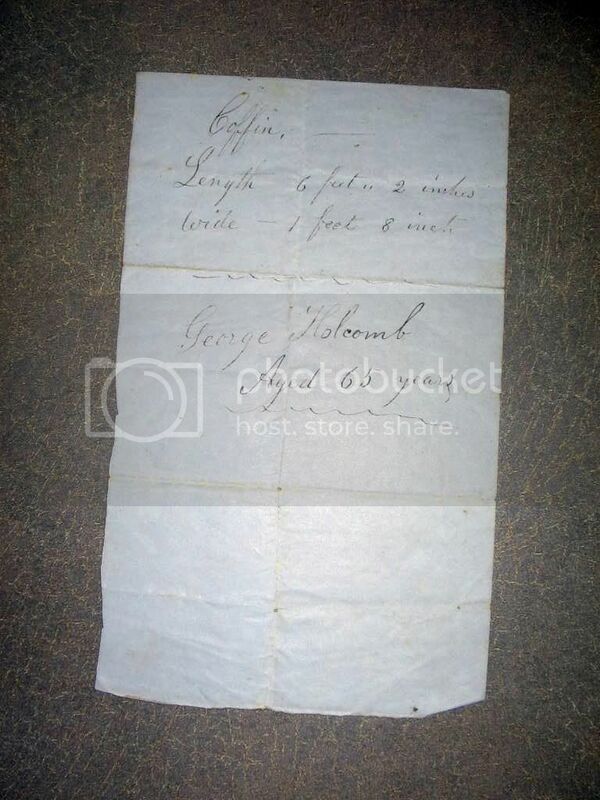 This was the measurements for George Holcomb's (the father)coffin. He died in 1856. Bateman late of the town of Nassau in the county of Rensselaer deceased. his self, his heirs and assigns forever. to hold the same to themselves their hiers and assignts forever. nominate and appoint my son Clark Bateman and my friend Aaron V.
all former wills by me made. Thank you Lisa McKern for this transcription.